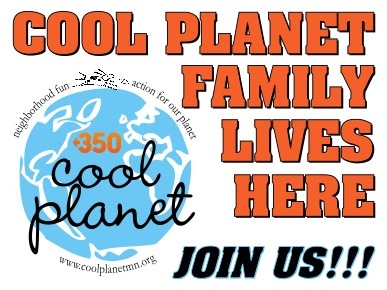 Our Cool Planet Family Lives Here program is working to make Edina and your city a Deeper Shade of Green through education in the Edina Public Schools, with Edina Parks programs, and through Minneapolis Community Ed. What can one person and one family do to live a more sustainable, healthy and fit life? Join this interactive, multi-generational, two-session family action workshop to find out! Become a “deeper shade of green” by looking at your household energy consumption, waste reduction habits, personal fitness and active citizenship. Sharpen your skills as an energy detective, engage your community in action, and earn your “Cool Planet Family Lives Here” yard sign. Family members encouraged to attend together. Recommended for ages 8 and up. Instructors Mindy Ahler and Paul Thompson. 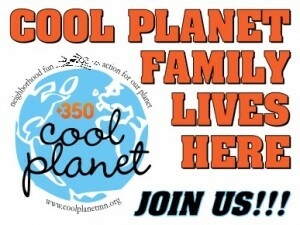 We can bring the “Cool Planet Family Lives Here” program to your location. Contact us for more information and to request a custom class.